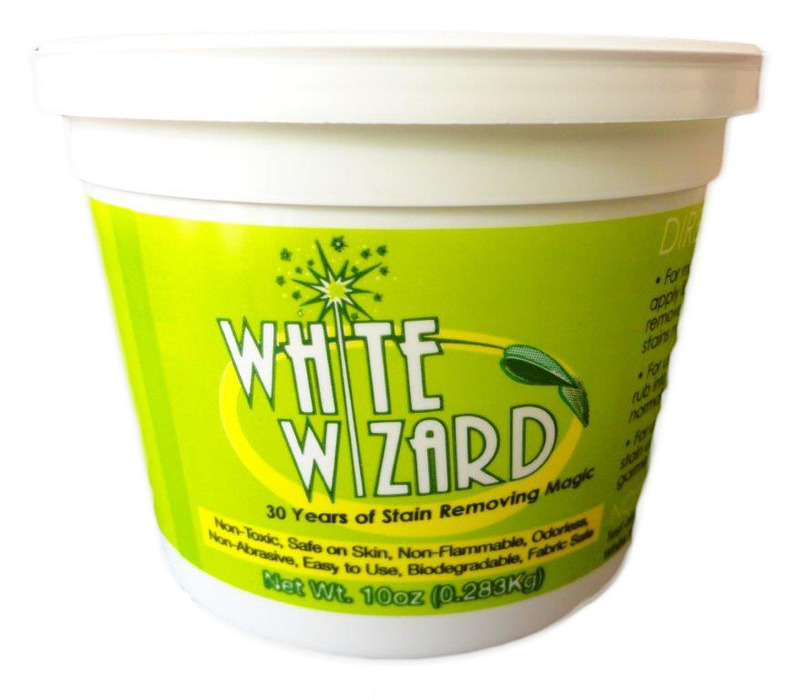 "White Wizard Spot Remover & All Purpose Cleaner"
White Wizard Spot Remover and All Purpose Cleaner is SAFE to apply on any surface or fabric. This biodegradable cleaner is odorless, non-toxic, non-flammable and non-abrasive. It is safe to use around the house or office on any surface or fabric, from leather and upholstery, to carpet and clothes. This powerful cleaner does not contain any bleach, petroleum, or harmful chemicals and it is completely safe to use around children and pets. White Wizard cleaner is SIMPLE to use and easily removes tough stains without water. Simply apply the cream to the stain with a soft cloth. Rub the cream in, then wipe it out with a damp cloth. No more stains and no residue left behind. It's that simple! White Wizard stain remover effectively cleans carpet, bed sheets, pillow cases, furniture, clothing, leather, shirts, dresses, pants, suits, ties, car interiors, upholstery, headliners, boat interiors and even your finest fabric without damage or leaving residue. Use White Wizard Spot Remover and All Purpose Cleaner to make your shoes look new again. Clean and preserve leather and vinyl, or use it as a pre-wash on shirt collars and cuffs. It can also be used as an emergency hand cleaner. 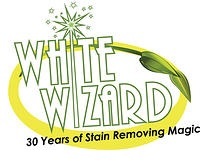 For decades government agencies, the U.S. military and commercial establishments, such as Disney and the Hilton Hotels, have used White Wizard Spot Remover and now you can use it in your home or office to eliminate stubborn stains from virtually any colorfast surface or fabric. Note: This product will NOT remove PERMANENT DYES or PERMANENT INKS. CARPETS,CLOTHES, UPHOLSTERY FABRICS: Apply to soil or stain with soft cloth and rub in. Wipe out with clean damp cloth. For overall upholstery cleaning use the same procedure cleaning a small area at a time. ON CLOTHES, rub into stain, then wash or dry clean. Use a soft brush on hardy fabrics. STUBBORN STAINS, rub White Wizard in and leave overnight, then remove as above. NOTE: Occasionally urine will adversely affect colour pigment of carpets. If discolouration is visible after cleaning, carefully match colour with a reliable fabric dye shading in a little at a time until proper match is achieved. VINYL, PLASTIC, LEATHER, RUBBER: Apply with soft brush, wipe with damp cloth. White Wizard contains conditioner to prevent drying and cracking. White Wizard will not remove ball point pen ink from vinyl. WOODWORK, WALLS: Apply with soft cloth, wipe off with damp cloth. On crayon marks apply with soft brush to remove wax deposits, then apply more to remove colour stain. Avoid hard rubbing on water based paints. WINDOWS, CHROME, BAKED ENAMEL: Apply with cloth, buff with dry cloth. CARS, BOATS, RV's: Instructions for materials as listed above. NOTE: SOME MATERIALS DO NOT HAVE COLOUR FAST DYES. PLEASE TEST BEFORE CLEANING.